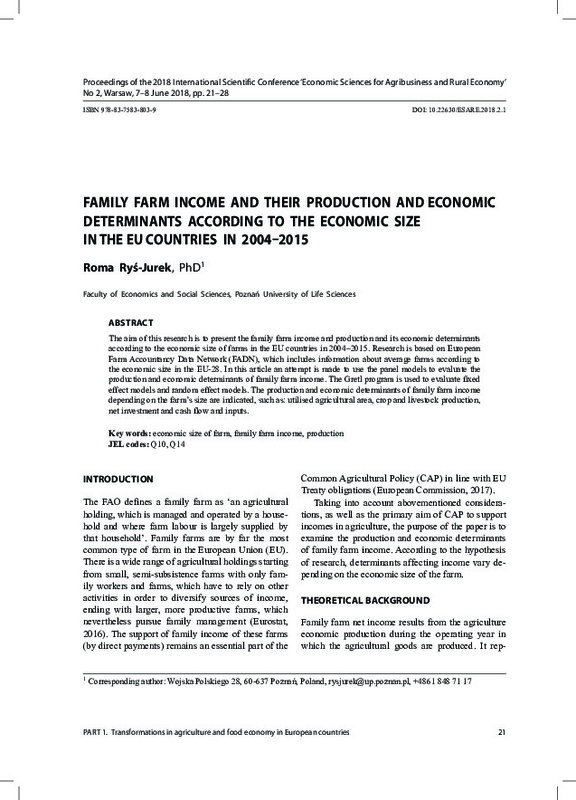 The aim of this research is to present the family farm income and production and its economic determinants according to the economic size of farms in the EU countries in 2004–2015. Research is based on European Farm Accountancy Data Network (FADN), which includes information about average farms according to the economic size in the EU-28. In this article an attempt is made to use the panel models to evaluate the production and economic determinants of family farm income. The Gretl program is used to evaluate fixed effect models and random effect models. The production and economic determinants of family farm income depending on the farm’s size are indicated, such as: utilised agricultural area, crop and livestock production, net investment and cash flow and inputs.